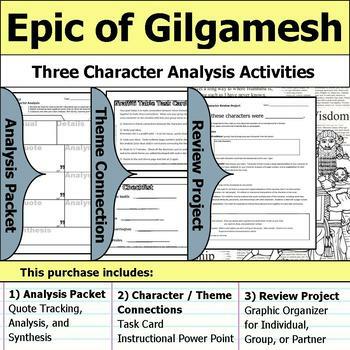 This purchase contains three character-focused assignments (Character Analysis Packet, Character-Theme Graffiti Table, and a Character Review Project), including multiple opportunities for art and group work. In a given unit, you likely do not have time (nor will students have the interest) in completing all three. Peruse the options and choose the best one or two for your students. Character Analysis Packet is an organized space for students to track the development of key characters throughout a text. There is guided space for students to illustrate, describe, record and analyze evidence, and finally synthesize their ideas. This is a great tool for students of all levels to use throughout the duration of the text. Students track the development of the protagonist in addition to tracking how minor characters impact that development in this Character Analysis Packet. I like to print the entire packet at the beginning of the unit and encourage students to work alone or in groups (depending on my classroom dynamics) to explore the characters more deeply. This packet is clearly formatted for students to, first, sketch and describe each character before delving into the deeper analysis and synthesis. This packet includes a graphic-organizer style notes for students and a “Notes to Teacher” document with tips for including and extending this packet. Character-Theme Graffiti Table is an action-packed way to get students analyzing minor characters and how they support theme development in a text. Students work in groups to add evidence and analysis to ideas graffiti-style, encouraging them to build and develop other groups' work. This is a great team-building lesson and segues nicely into essay planning. Get students moving and making deep connections between minor characters and themes in this creative activity. Students work in small groups to connect minor characters to themes graffiti-style and code their answers to ensure they are analyzing and supporting their ideas with evidence. I love using this to get students carefully considering the roles of minor characters in the plot. This lesson contains a task card with instructions and printable character checklist for students, a PowerPoint to guide instructions, and “Notes to Teacher” with tips on implementing this activity in your classroom. Character Review Project has students work in groups to generate ideas for the main characters pertaining to a non-human topic (for example: food, animals, kitchen utensils, etc.) Students can work individually with one character from the story or in pairs or groups with more characters. The wording on each document changes slightly to reflect individual, partner, or group work. Students draw, return to the novel for quotes, and write explanations that connect their ideas and their evidence. This is a creative project that encourages abstract thinking and evidence-based writing.